ResurfacePro can make old, worn concrete look like new. 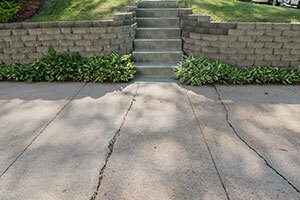 Cracked, broken and pitted concrete driveways, sidewalks and patios are more than just an eyesore - they lower the value of your home. But concrete replacement can be expensive and extremely disruptive, plus, it doesn't address the root of the problem. Now, there's a new alternative: the ResurfacePro system, which coats your broken and unsightly concrete surfaces with a durable layer of polymer cement, giving it a brand-new look and restoring its function - and it can be ready for use in just a couple days. If you're interested in concrete resurfacing, contact the experts at Dry Pro Foundation and Crawlspace Specialists today to schedule your on-site inspection and free cost estimate. Your concrete - especially your driveway - is your home's calling card. It's often the first thing a visitor sees as they approach. So when it's cracked, pitted and broken, it creates a not-so-good first impression. Not only that, but unsightly concrete also lowers the value of your home. 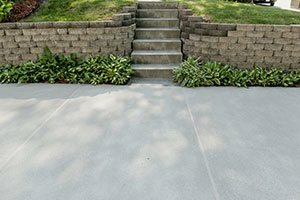 Renewing your concrete immediately improves your home's curb appeal. But what's the best approach to take? You'd think that to get that brand-new look for your driveway, patio or pool deck, you'd need to replace it with new concrete, right? Well, that's one way to do it... but total concrete replacement is seriously disruptive and seriously expensive. First, it has to be jackhammered into chunks and hauled away. Then it has to be framed, and then new concrete is poured. Finally, it has to cure - and that can take up to several weeks - during which time it is unusable. 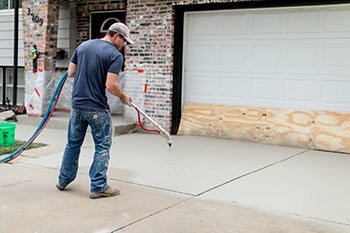 Resurfacing your concrete, however, offers the advantages of replacement, often at a lower price, and it can be used within just a couple days. And because ResurfacePro is part of a total concrete protection system that includes PolyLevel™ to lift and level uneven slabs, your renewed concrete will be resting on stable soil. Unlike replacement concrete, which still sits on the same poor soil that caused a lot of the problems to begin with. The system also includes NexusPro to seal joints and cracks and SealantPro to protect the surface from stains, pitting and flaking. Combined with ResurfacePro, these form a true concrete protection system that offers you a complete solution to your unsightly concrete. First, PolyLevel lifts, levels and supports your slabs. Then your concrete is power-washed to open up its pores and rid it of any debris. Next, the cracks in your concrete are sealed and repaired. Then, ResurfacePro is applied to the concrete for a like-new look. A coat of SealantPro ensures years of protection. Finally, control joints are sealed with NexusPro. That's it! Your concrete is renewed and ready to use within just a couple days! Our concrete experts will come to your home and walk you through a thorough inspection. You'll then receive a detailed estimate at the appointment for a ResurfacePro solution that's customized for your driveway, patio or pool deck.